A specific phobia is an intense, irrational fear of something that poses little or no actual danger. 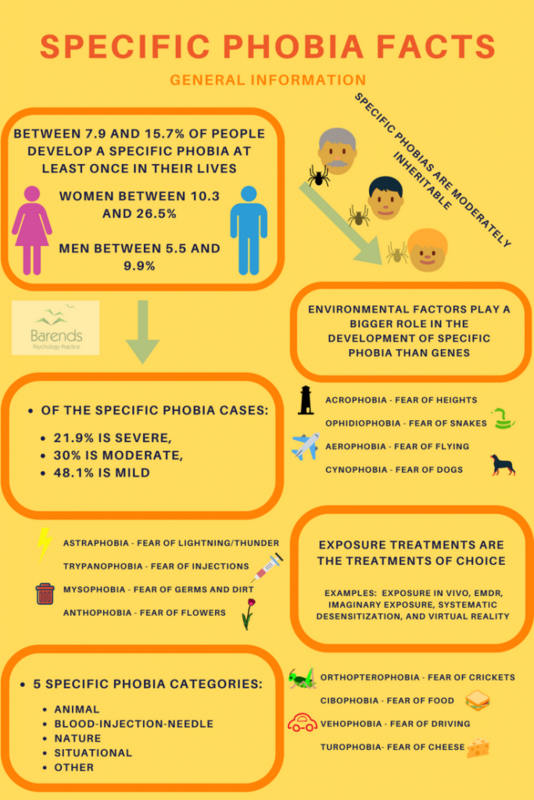 Some of the more common specific phobias are centred around closed-in places, heights, escalators, tunnels, highway driving, water, flying, dogs, and injuries involving blood. Such phobias aren’t just extreme fear; they are irrational fear of a particular thing. You may be able to ski the world’s tallest mountains with ease but be unable to go above the 5th floor of an office building. While adults with phobias realise that these fears are irrational, they often find that facing, or even thinking about facing, the feared object or situation brings on a panic attack or severe anxiety. Cognitive Behavioural Therapy via Solihull CBT can help with this in an average of 6-12 sessions and also covers Birmingham and the west midlands. There is also the option to have a specialised 1 day "complete treatment" session for certain specific phobias which has an equal success rate as 6 sessions.